Great track tire for intermediate level. Very grippy and very predictable. I don't use tire warmers, these warm up great with one well-paced lap. On the track you won't wear out the center. I also use it for my BMW 1000rr on the road. 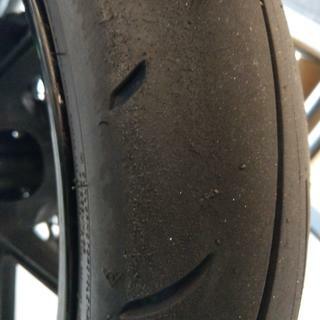 Bought this tire after the Bridgestone S21 made my FZ09 handle like a harley. Put this tire on and the quick, nimble feeling is back! Almost scared myself the first time out. It's cool here (40-50F) so I can't say anything about outright grip, but it's hooked up well so far. Liking this tire a lot! Have had 6-7 sets of these tires, while they may not last very long (1000 miles a rear, 2000 on the front) they are a great tires and stick really well once warm. Have used them on the track and on street and I have nothing bad to say about these tires! just as good as before if not better. improved tire and about the same price. If you want to know the difference between Q3 vs Q3+ front the Q3+ is stiffer and give you better feed back on the road. 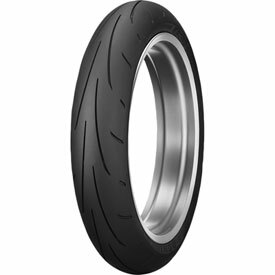 The only front tire that feels better on road in my opinion is Metzeler K2 but they cost more. For the money you can't buy a better tire for fast street riding. Dunlop Q3’s are my “go to” tire for my bikes! Great tires all-around! Turn-in, side-grip and control are exceptional. Very-confidence inspiring for canyon carving or track days. Best overall tire. I commute everyday and it the canyons every weekend. They heat up quickly and most importantly they stay hot. It's an aggressive tire, every corner feels controlled. This tire never fails to impress me. The added longevity is an improvement. Great tire so far. Put 400 or so miles with both twisties and hi-way. Turn in is better than any tire I have had on there.